Created under what turned out to be an expansive amount of evaluations at the Global Exploration Workshop in November, Boeing’s Moon Mission Concept with a re-usable Lunar lander has raise eyebrows in internal circles. Using a Global Exploration Roadmap, the approach utilizes “Near term focus on guiding capabilities, technologies and leveraging ISS,” prior to expanding to “Long term focus (on) Discovery Driven – and Enhanced by – Emerging Technologies”. While such talk has been heard before, during the continued lack of an exploration roadmap that can provide any real definition, the presentation makes the jump towards a mission goal which has seen its stock raised over recent months, one which involves the crewed return to the Lunar Surface, as the opening prime exploration mission for NASA. 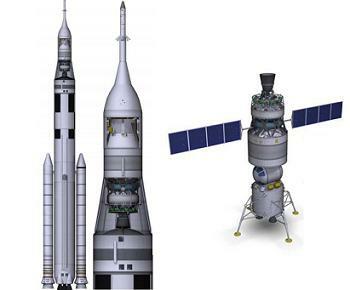 Currently, Orion’s opening two missions via the Space Launch System (SLS) are Lunar flights, but ones which do not result in footsteps on the Moon’s surface. The first uncrewed mission is scheduled to launch in 2017, followed by a crewed Apollo 8-style mission, officially manifested for 2021, as much as work is continuing to push this mission to the left by at least two years. Work is continuing – under the leadership of former Space Shuttle Program (SSP) manager John Shannon – on an exploration roadmap, of which there are no official details. Rumors of some sort of a plan being revealed in November are now likely related to the workshop, as opposed to a much-wanted centralized plan. However, the same source information (L2) did note the November meeting would include proposals from advocates of a Lunar landing mission in the early 2020′s – known unofficially as – Lunar Surface First – as has turned out to be the reality. The current plan is vague, with references to a Near Earth Object (NEO) mission in the mid 2020s, on a path to crewed missions to Mars in the 2030s. However, documentation now exists, based around a crewed return to the moon as part of an ambitious plan put forward under the Boeing banner. Central to the plan is a deep space platform, known as a gateway, located at Earth-Moon Lagrange (EML) point 1 or 2, after being built from pre-launched hardware, providing the host station for a reusable Lunar Lander – which would also be launched by the SLS Heavy Lift Launch Vehicle (HLV). 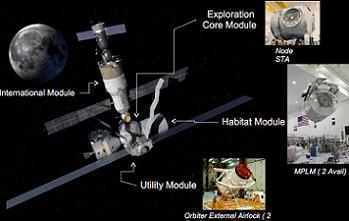 Such a concept was previously overviewed in August, showing how the existing hardware would be launched to the ISS – using Atlas launch vehicles in the example cited – prior to full assembly using ISS assets such as the Space Station Remote Manipulator System (SSRMS). 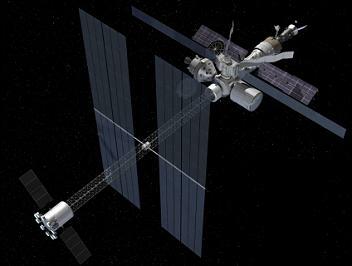 Once constructed, a space tug – powered either by solar electric or chemical – would be utilized to raise the platform to the EML point. Such a proposal claims to be ready for the arrival of crewed missions via the SLS by 2022 – as much as any timeline would be based on the readiness and evolvability of the SLS. “A Gateway at EML1 or EML2 allows re-usability of the lunar lander which saves money and enhances development of the ultra-reliable systems needed for Mars,” noted the November presentation. 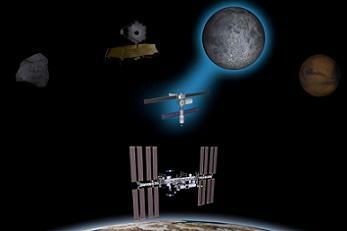 HLV capabilities for higher energy missions beyond LEO were examined. This required the use of upper stages. Existing stages from Delta IV and Atlas V and new stage designs using RL-10B2 (existing), RL-60 and J-2X LOX/LH2 rocket engines (as now chosen) were used to estimate payloads to Geosynchronous Transfer Orbit, Geosynchronous Orbit, Trans-Lunar Injection and to the Earth-Moon L1 point,” the presentation noted. This use of EML-1 related to the launch of a single HLV, carrying a depot to be refuelled using commercial vehicles, reducing the mass required to launch from Earth’s surface on a Lunar or deep space mission via “dry” – and potentially reusable – landers. 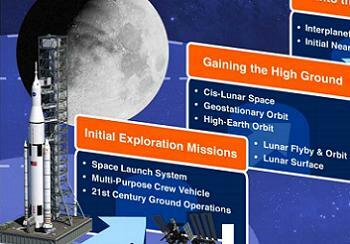 Such a plan would result in SLS with an EDS (Earth Departure Stage) delivering Orion and a dry lunar lander to L1. 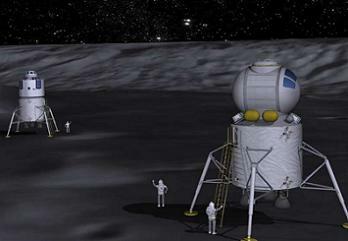 The dry lunar lander would be loaded with 25mt of propellants at the depot to complete the lunar phase of its mission. 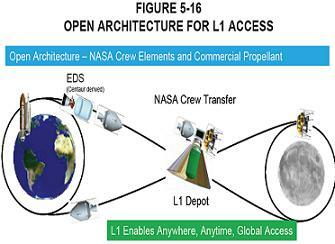 Dry launch of the LSAM element to L1 would dramatically reduce the spacecraft weight constraints, permitting more flexible and robust operational capabilities to be designed into the lander. While the main focus of a fuel depot would be angled towards a broader use of propellent refueling – in effect a gas station in space where fuel would be stored in-situ – the November presentation takes a secondary approach, by having a ready to use platform already at L1, with fuel for the lander arriving via the SLS ready for immediate transfer. In fact, the first customer to arrive at the platform would likely be the dry lander, while the gateway station was still located at the ISS, prior to the entire stack being sent into deep space via a tug. Once all the hardware is in place at EML-1, the presentation claims there is potential for a single SLS to carry out a full lunar surface mission, as much as the key will be on the evolution of the SLS’ third stage. 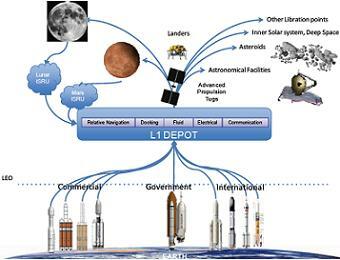 In essence, the potential scenario calls for: The launch of the station/gateway platform to Earth-Moon L1 or L2, via a space tug, following assembly at the ISS. Potentially the launch of a reusable LOX/methane lander to the L1/2 Gateway – as much as it’s likely the lander would be sent to the gateway whilst it was still at the ISS. The Launch of the SLS with an Orion and a modified Delta Cryogenic Second Stage (DCSS) to the Gateway. The scenario then calls for the use first burn of DCSS to stop at Gateway and dock, where it would transfer LOX and methane from DCSS to lander – with the methane stored in an extra tank in-between LOX and LH2. The mission would then be initiated, with a lunar landing using the DCSS to inject to the Moon, with around three DCSS burns being utilized. 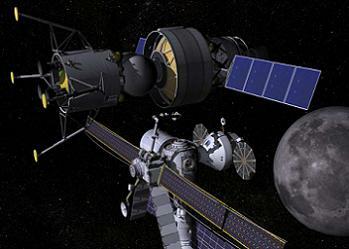 The crew would then return to Gateway Platform in the lander, transfer themselves over to the berthed Orion, and return to Earth with a burn from Orion’s SM. It should be noted that all of the key elements would likely be refined prior to a complete plan, as noted in the presentations operational considerations. “The goal for recurring operations should be to deliver the crew and all fuel for the lander in a single SLS launch,” added the presentation. Other benefits of a gateway platform are also cited in the overview, such as the potential for telerobotic control of hardware on the lunar surface, the launching of lunar habs to the Moon’s surface, and further references to using this baseline to ramp up towards Mars missions.